Keeping in sync with the latest fashion trends, we are engaged in providing a trendy array of Tomato Paste. 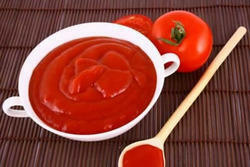 We Are A Quality Exporter Of Tomato Paste , We Can Offer A 28-30 Brix Tomato Paste Use For Many Application. Our tomato paste is a thick, rich, tomato concentrate that will create a tasty and nutritious base for countless recipes from pizza sauce to a great topping for pasta. With a firm commitment to quality, we are involved in offering a wide ambit of Kissan Tomato Puree. Tomato paste are manufactured using red sound ripe tomatoes which are not genetically modified and is from the last seasonal crop. Farm Fresh aseptic Tomato paste and puree are manufactured from sound, mature, selected Tomato, free from damage, soil & cuts. Selected Tomato fruits are sorted, washed, inspected, crushed & carefully pulped. Tomato - Being located in the heart of a Tomato belt provides us significant advantage of sourcing garden fresh quality product for preparation of tomato paste/puree. 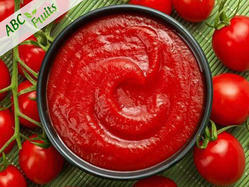 We are offering an exclusive range of superb quality Tomato Paste to our clients. It is processed using the highest quality exceeding industry standards and using fresh and natural tomatoes. The paste doesn't lose its natural properties such as the flavor and its nutrient value.